Have you ever looked for something, not found it, replaced it with a new one, and then found the old one the next day? This happens all too often when items either are mixed in with other things or do not have a specific place. Problems like this can be solved by using the 5S management tool. If those outcomes are appealing to you, then you might want to consider how the 5S management tool might benefit you and your employees. Let’s dive in to the details and learn this methodology that will have you organize your workplaces through the steps of sort, set in order, shine, standardize and sustain. Just like eating an elephant, implementing a 5S strategy must be done one “bite” at a time. This means you need to select an area in which you will begin. Don’t take on too much at first, just find a work station, office or storage room that can benefit from organization and off you go! The first step to employing the 5S management tool is to sort the tools, supplies, equipment, containers, materials found in the area. Over time, processes change and there may be items that were used some time ago, but are now obsolete and cumbersome. Occasionally, employees may not know the best course of action to take, in that case, they may choose to tag an item with information such as where and when it was found and the name of the person applying the tag. Tagged items are then placed in a designated area in the workplace to await the time when someone needs it. If a determined amount of time passes (such as 2 months), and the item was never needed, then a disposition decision can be made, and the item removed from the area. Once the sorting is done, only useful items remain in the area to be set in order. Now it is time to organize what is left, the meaningful materials that are necessary to complete the activities in the work area. Employees should think through several key ideas as they begin to determine assigned places for the needed materials, tools, supplies and other items. Knowing who uses the item is a main factor to consider when deciding where an object should be placed when not in use. It must be readily accessible if it is a commonly used item. The flow of the tasks could also be an important input as to where items are placed in relation to each other. Things that come in sets, or that are otherwise related or similar are often placed near each other, so users know to go to that area to get any of that type of thing. Lastly, simple logic must be used to cut down unnecessary movement. Another aspect to the step Set in Order, is to consider what may need to be added to the area to make it more orderly: additional storage containers and visual management tools such as tape on floors or workbenches, labels for shelves, drawers or bins, shadow boards and signs. The point is to organize what is really needed so that the all users can find what they need when they need it. And when everything has an optimal place, and is in it’s place, it is much easier to keep the area clean. Sweeping, mopping, dusting, putting materials, supplies, tools and other objects away are the essence of the Shine phase. “Isn’t that the custodial team’s job?” you might ask. NO, it isn’t. In a 5S workplace, cleaning is everyone’s job. When people lend a hand in cleaning their own area, they take more ownership. This may also apply to the cleaning of equipment which can reduce down-time. Companies that are new to 5S might complete these first 3 phases and think, “We did it!” The areas are uncluttered, organized and clean, and that is something to celebrate, but 5S doesn’t stop there. Without standardizing the process, it is likely that old habits will prevail, and the work areas will return to a less than desirable state. 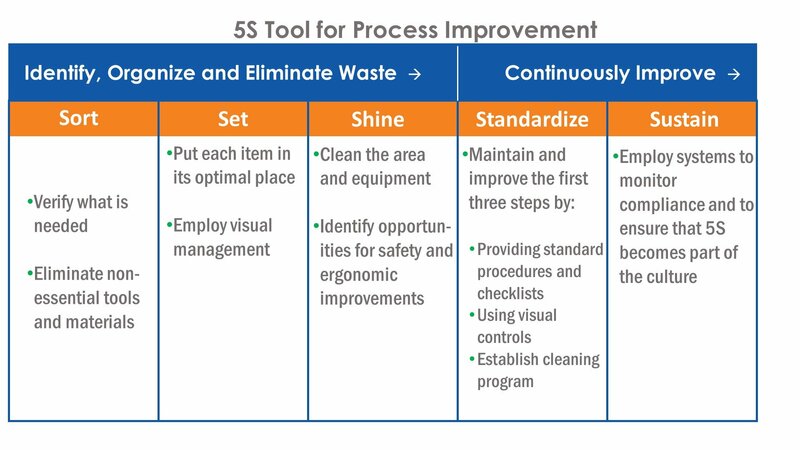 The Standardize phase is what makes 5S so much more meaningful than just an annual clean up initiative. During this step, companies will create standard operating procedures to ensure that new habits are established and that work places will remain in good shape. Like all processes and procedures, the simpler the better. Decide what works and work what you decide. Any written guidance for employees must be maintained and reviewed for continued suitability from time to time. New employees must be made aware of the 5S program and how they will help contribute to its success. Likewise, employees who are transferred to a new area or function, should be made aware of these procedures for their new tasks. Managers and employees should work together to maintain a workplace that is efficient, orderly, and clean on an ongoing basis. Ultimately, 5S becomes a part of a company’s culture, not just a program. Though using the 5S tool is not a requirement in ISO 9001:2015, it may be useful in showing evidence to your auditor that you are taking the requirements in 4.4.1 and 8.5.1d very seriously. When work areas are functional and clean, companies have a better chance for achieving positive process results, higher quality, increased productivity, reduced cost, increased employee satisfaction and a safer workplace. 5S is a methodology for realizing these benefits. With these procedures implemented and monitored, you can expect that your workplace will be maintained in a suitable manner and will lend itself to be a valuable asset.